Not many people realise that the world’s first ever recorded cycle race was won by a man born in Bury St Edmunds. 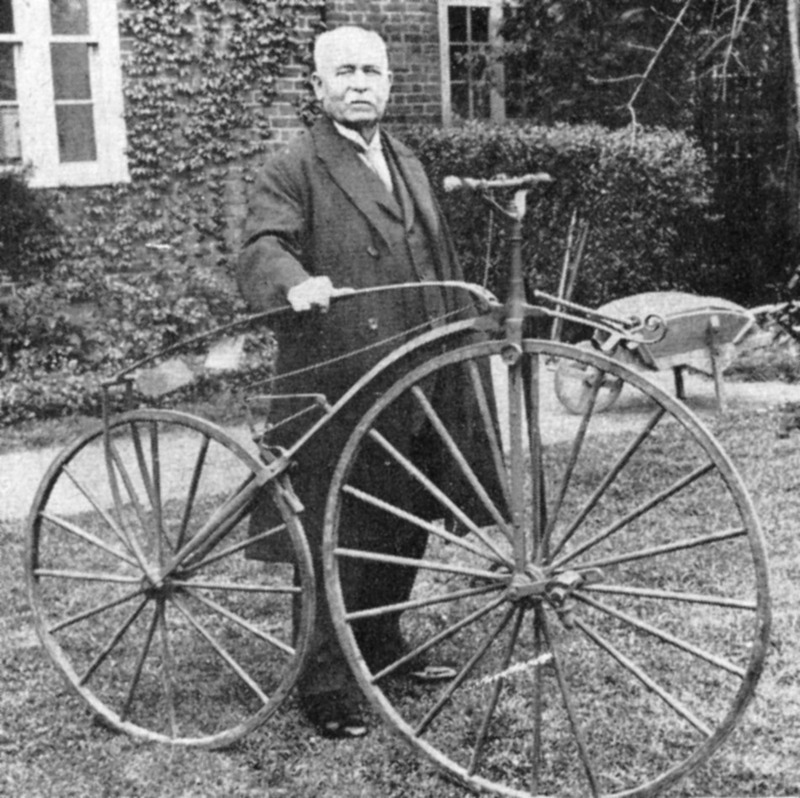 The story is unrelated to that of the West Suffolk Wheelers, but I think that no record of local cycling should pass without at least some mention of James Moore, who in May 1869, pedalled his Michaux machine to victory in Paris. During my time as a sub-editor with the Bury Free Press in the sixties I made great efforts to discover his actual birthplace and any further connections between Moore and the town. My search took me to Witchford, near Ely, where I met and spent an interesting couple of hours with Moore’s son, who showed me the very bike on which his father rode to that famous victory. James Moore junior obviously realised the value of the historic machine as it was chained to a wall in his large garage. I didn’t get a chance to ride it, but I felt the weight – it must have been all of 60 pounds! Among the other precious possessions at Witchford was a large, priceless, solid gold cup which had been won by James Moore senior during his career. My visit to Witchford was in November 1970 – just over 100 years after that historic first race. It had taken me many months to track down James Moore junior, and I would not have done so had it not been for the help of my friend, cycling journalist Jock Wadley. I also received a great deal of information about Moore and his achievements from Peter Clifford, who ran an organisation known as the International Saddle Club. James Moore senior was one of eight children. The family had moved from Bury to Paris in 1854 in order for his father, who started his working career as a blacksmith, to further an interest in animal medicine. Young James was just four and a half years old at the time of the move. In France, the young Moore’s father bought him his first cycle (a birthday present in 1865) from the Parisian Michaux Velocipede workshop. Within three years young James had learned well, and was being coached by Ernest Michaux. Then came his big chance. A plan to organise a cycle race drew international interest. The route was over 1200 metres, along a cinder path normally used by runners, close to the River Seine in the Parc Bois de Boulogne at Port St Cloud. James, a slender figure of a man at just 19 years of age, trundled his heavy wooden bone-shaker to the start line, watched by a large crowd of “chaperones and belles.” He and other riders sponsored by Michaux, tossed up to decide who should be the first to ride a newly developed bike with cranks and pedals. Moore won and so became the first cyclist ever to use pedals. A bugle sounded the start and Moore led straight away and won easily by several lengths from Castera, Drouet and Polocini. He then went on to win a second race, this time again beating his great friend and rival Castera. His prize was a gold medallion – which, incidentally, was also shown to me by James Moore junior. There followed a series of races all over provincial France. James Moore, junior, took up the story: “My father won races at La Varenne, St Hillaire, Charenton, Rainey, Charny and Cognac. Two of the best French racers at that period were Moret and Castera, but my father beat them both in several races. He also won a special challenge at the Pans Hippodrome against a rider called Sue, who was the champion of Bordeaux. 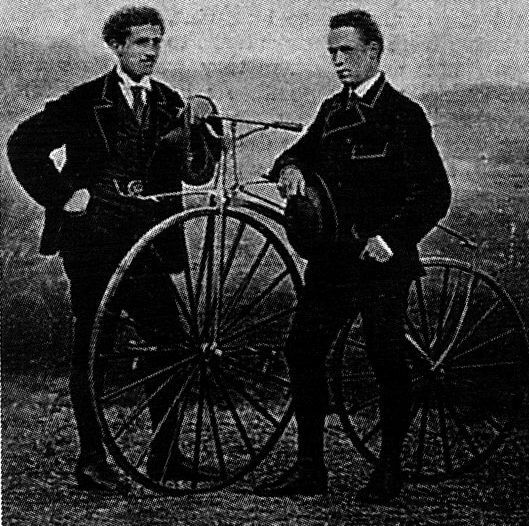 In 1869 four riders – Castera, Moret, Bon and Laumaille – formed a combine with the intention of monopolising the various cycle races, which by now were becoming popular. They fought shy of riding in the capital and raced in the provinces only. None of them faced my father. Moore’s next major triumph came in November, the following year, when he won an international race from Paris to Rouen in atrocious weather, finishing a staggering 45 minutes ahead of the second man. His son continued: “There were more than 200 riders in that race, which started at 7 am from le Place de l’Etoile, now known as the Place de Charles de Gaulle – by l’Arc de Triomphe. The route was by way of St Germaine, Mantes, Vernon and Pont de FArches, with the winning post at the Octroi Gates in Rouen. The riders were divided into two groups, odd and even numbers. My father was drawn number 187. The even numbers started first and the odds half an hour later! All his main rivals had drawn even numbers, so he was well behind at the start. However, he had caught most of them by the half way point at Bonniers, where only an Englishman, called Johnson, and Pascaud were still ahead, with Castera and Bobilier just behind. “When he caught Johnson, the Englishmen said: ‘Why don’t we ride together to beat the rest.’ ‘Certainly,’ my father replied – ‘If you can keep up with me!’ He went on to finish 15 minutes ahead of Castera and Bobilier, who contrived to be equal second. Johnson weakened and lost a lot of time, finishing in eighth place. My father’s total time for the 134 kilometres was 10 hours 15 minutes. All who finished within 24 hours received a medal. After the race there was a grand ball and my father danced until 6.30am the next day. But while he was celebrating, his cycle was stolen. “After several more successes in France, my father came back to his native country in 1870 to compete for the first ever British Championship – at Wolverhampton. He rode a Meyer Spider machine which had by then been developed from the old boneshaker. It had 42- inch radial spoked wheels and solid rubber tyres. Tubular steel had replaced the wooden framework. Although he won his first heats, he fell heavily in a later round and injured his head. James Moore junior told me of a special challenge match arranged between his father and a top English runner, Jim Nuttall, who held the 600 yards and half mile records. The challenge was over 400 yards, with the runner getting ten yards start. Moore had a standing start and had to mount his machine, but still won by a yard, in 45.5 seconds. In the same year he beat the English half mile and ex-mile champion J Palmer in a one-mile scratch race. He also beat Johnson in a 25 mile road race. In a 50 mile race at Lillie Bridge on January 13, 1873 he gave Johnson a two mile start, but still won easily. After his famous cycling career, James Moore also worked in medicine, turning to the care of animals as a veterinary surgeon. He later became a successful racehorse trainer at Maisons Laffitte. He also played tennis well and at the age of 72 took up golf and became an eight handicap player! In the Siege of Paris during the Franco-Prussian war, he served in the ambulance corps. “Like my father, I went on to practice animal medicine in Paris. I was also an athlete,” said Moore junior. In fact he also enjoyed a successful sporting career. As a runner, he was just one tenth of a second outside the world 100 metres record and was later a top tennis player at the Racing Club de Paris. He also drove racing cars and won three races at the old Brooklands’ track, driving a Humber. Peter Clifford told me that James Moore, who was born on January 14 1849, also died in Bury St Edmunds in 1940 – at the age of 91 – while visiting members of his family. This information was attributed by Clifford to a Victor Breyer, but I was never able to verify this fact. It is certain that Moore had moved back to England just before the onset of the Second World War, and was in failing health. Further delving revealed at least four different dates for Moore’s death between 1935-40. More research is necessary on this point. Personally, I think that he died in Hampstead, North London. However, my searches did reveal that James Moore was born at 99 Long Brackland, Bury. This fact was gleaned with the help of the census returns for 1851 and is verified by Moore’s actual birth certificate (of which I have a copy). The only mystery which remains is the actual whereabouts of 99 Long Brackland. By the time of the 1861 census, houses in the street had been re-numbered and in more modern times, the whole area has been re-developed. Once again lack of time has prevented me from continuing with this sleuthing work. A famous velodrome, the Parc des Princes, was constructed near to the spot where Moore won his first race. For many years it was used as the finish point for the Tour de France. British world champion sprinter Reg Harris was a regular competitor there just after the last war. Unfortunately the stadium was demolished in 1967 to make way for a new road! Today a simple plaque can be seen nearby. Erected in 1938 it is inscribed: “On 31st May at Saint Cloud, James Moore won the first velocipede race organised in France – Touring Club de France.” It is a great pity that the town of Bury St Edmunds has never known about, let alone honoured, this historic achievement!